Stunning reds, yellows, and oversaturated flesh tones rendered in comic book dots flash before our eyes. Images of growling men, muscles tensed, fists clenched duel with airborne acrobats defying gravity as elegant, feline women dressed as preening princesses; each as deadly as they are beautiful. A cut and paste montage of vintage Kung Fu posters, each featuring a superstar of the Golden Age of martial arts films, Bruce Lee, Gordon Liu, Angela Mao, Sammo Hung and Cheng Pei Pei amongst others host the opening credits for the film that martial arts enthusiasts the world over have waited decades to see. The kinetic use of the faces of those Golden Harvest/ Shaw Brothers legends shows a fair amount of cheek as if calling down these Kung Fu gods to lend their blessing to. The inclusion in the montage of the stars of the piece, Jackie Chan and Jet Li themselves, marks an awareness of what’s at stake. Does The Forbidden Kingdom live up to its heady expectations? Well …. 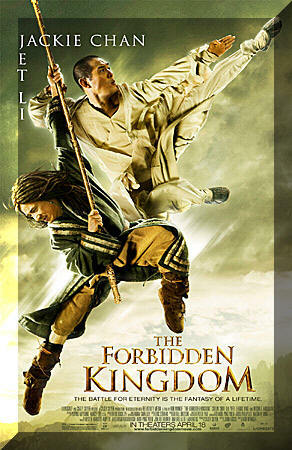 It was a canny choice to aim The Forbidden Kingdom at a younger audience. Ostensibly, the story is a variation of Journey to the West, the classic Chinese tale of the Monkey King, Tripitaka the monk and his three disciples, and their battle against celestial deities. 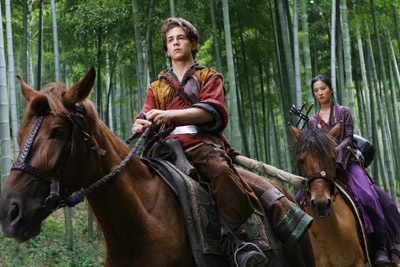 Only here Tripitaka is an American teenager in modern-day Boston named Jason Tripitikas, and he doesn’t look very monklike being harassed as the new boy in town by a gang of neighbourhood toughs. His only friend is the elderly Chinese owner of a video store that Jason haunts daily for any and every Kung Fu DVD he can find. Though every available space in his room is plastered with Kung Fu memorabilia and a Final Jeopardy-worthy knowledge of martial arts trivia, Jason has no actual fighting skill. When the neighbourhood bullies use him to rob the video store, Jason watches helplessly as they commit a terrible crime. In the frenzied chase that follows, Jason grabs a golden staff precious to the store owner and plunges off the roof of a building, landing in a place that’s definitely not South Boston. Coming to in a hut in the ancient Chinese countryside, Jason truly is the stranger in a strange land. He crosses paths with Lu Yan, a Kung Fu master with a taste for firewater, who may or may not be immortal. Lu Yan recognises the staff that Jason holds and reveals that it was stolen from the Monkey King, who was imprisoned in stone by a jealous deity, Jade Warlord. Only the return of his staff will free the Monkey King and open the dimensional gate Jason needs to return to his own time. Before long, word of the staff’s reappearance makes its way to the Jade Warlord, who sends out his minions, headed by the witch, Ni Chang, to retrieve the relic and keep the Monkey King a prisoner forever. The good guys are joined by Golden Sparrow, a young woman bent on avenging the death of her family at the hands of the Jade Warlord. 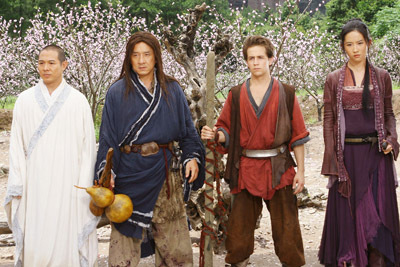 Later, Jason has the staff stripped from him by the Silent Monk, who isn’t as evil – or silent – as he initially seems, and he battles Lu Yan for the ownership of the golden staff before realising they are on the same side. Yay, another Kung Fu master on the team! Stung by his own uselessness, Jason asks both men to teach him to fight as they prepare for their inevitable battle against the Jade Warlord. Yeah, enough with the bla-bla-bla, how about the fight? The fight martial arts fans have waited 20-odd years to see? 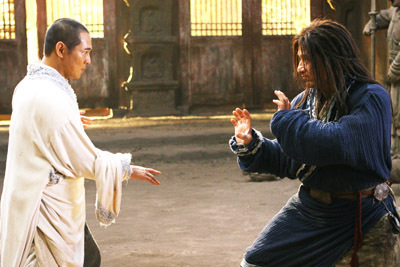 The big square-off between Jackie Chan and Jet Li comes about a third into the film during the battle for the sacred staff between Silent Monk and Lu Yan in the monk’s mountainside temple. Choreographed by action legend, Yuen Wo Ping, the fight does not disappoint. Bearing in mind that Jackie just turned 54 years old and Jet is a few weeks from turning 45, there is precious little to give away that either man has lost a step with passing years. Jet’s lightning-fast kicks and punches are slightly more visible to the human eye and Jackie’s matted, dreadlocked wig is a useful tool in hiding those few moments when it’s not actually him doing the multiple backflips and leaps. There’s a lot of quick edits and clever use of slo-mo to emphasise the majesty of each move these titans makes. Despite these small concessions to age, they go at each other with a ton of power and remarkable agility, and it’s thrilling to watch. 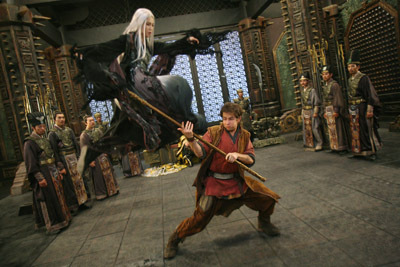 Another homage to their previous glories is Jackie’s character essentially recreating the Drunken Master of his breakout 1978 film and Jet’s Silent Monk played as a saucy version of Wong Fei-Hung from his Once Upon a Time in China series, and the fight choreography follows that of those characters. They are treading boards they know well. The fight is about 10 minutes long and is gripping from the first flying foot, as they battle with the staff, with Jet’s long robe, and in stunning hand to hand combat. It’s a twisting, turning wuxia concerto played by filmdom’s most famous virtuosos. I only wish there had been more moments like this. The problem with The Forbidden Kingdom is in the fact that both Jackie and Jet have to spend most of their time playing nanny to the helpless American boy. While that affords Jackie some good Drunken Master moments, the story should have taken place entirely on the main stage. 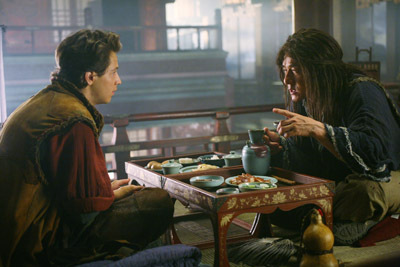 Why couldn’t the film have begun and ended in Ancient China? The distraction of the modern-day Boston bookend was unnecessary, but I’ll bet the studio didn’t feel that way. So we have this misfit Caucasian teenager learn what it is to be a Kung Fu master; if you were thinking The Karate Kid, you wouldn’t be alone, only this guy’s no Ralph Macchio. The young actor wasn’t particularly believable as a fighter or engaging enough for me to take my eyes off Jackie and Jet, so any moment spent on him became an annoyance. One can’t help but cheer as Jackie and Jet double team their efforts to train the young man, causing him extreme amounts of discomfort. Wax off, kid. The supporting cast is almost enough to put a salve on the irritant of the American interloper. 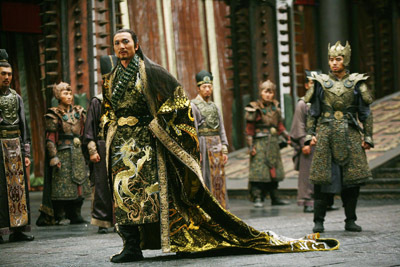 Collin Chou is fabulous is the eeevil Jade Warlord. Decked out in lavish gold-threaded dragon-festooned robes and sporting a heavy layer of blue eye-shadow on smugly-lowered lids, Chou chomps the scenery a like an order of General Tso’s chicken. Chou, who was exceptional in Donnie Yen’s Flash Point from earlier this year, matched Yen move for move in the film’s thrilling climax, holds his own believably against Jet Li here. As the vengeful Golden Sparrow, Liu Yifei is stunningly pretty and makes the correct angry faces and poses when she hurls her deadly jade hairpins at her enemies. Li Bing Bing’s character Ni Cheng was a bit of a letdown as we never get to see her wield her snowy locks as intensely as shown in previews. I expected damage like an over-the-top Sindel from Mortal Kombat or Medusa from Marvel Comic’s Inhumans series. She glowers and smirks nicely, but her performance is undone by some unfortunate wig-making that not only strikes her, but makes Jackie’s Rasta mop hard to look at, as well. 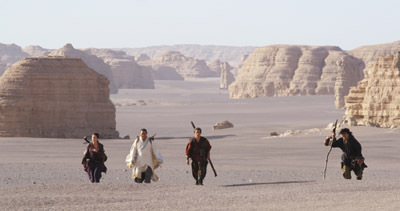 Made in China by an American director, Rob Minkoff, and featuring some beautiful cinematography of the verdant Chinese countryside, endless deserts and towering mountains, The Forbidden Kingdom is ultimately a study in compromises. It’s a shame that the Hollywood powers-that-be behind the movie didn’t have enough faith in the draw of its illustrious stars to base the picture around them completely. Luckily, it’s the very appeal of Jackie Chan and Jet Li which lifts the film above its flaws and indeed makes it palatable to those as yet uninitiated to their Kung Fu eminence. They appear to be having a rollicking time together and their comedy is just as effective as their fighting (- Jackie praying for rain is a classic moment). Thanks to these great tigers of China, The Forbidden Kingdom ends up being if not the martial arts masterpiece Kung Fu fans have been waiting for, then certainly a fun little action film and very much worth a look.